Elected leaders across the political spectrum expressed unease Friday at the prospect of President Donald Trump paying for his border wall using money siphoned from the Army Corps of Engineers, which could tap billions of dollars targeted to disaster relief or lawmakers’ home-state water projects. The reaction came swiftly from politicians as disparate as Republican Florida Gov. Ron DeSantis, a Trump ally, and California Democratic Rep. John Garamendi, who accused the White House of seeking to punish his blue-leaning state. And it served as a reminder that Trump might create as many political headaches as he solves if he tries to bypass Congress by declaring a national emergency in pursuit of the wall — an option he appeared to distance himself from Friday. The Army Corps, which has military leaders but a mostly civilian workforce, oversees congressionally approved projects throughout the country — from reconstructing dams and dredging canals to trying to restore Florida’s Everglades and Louisiana’s swiftly eroding coastal marshes. But its money is not limitless: Its regular civil works budget is about $ 6 billion a year, slightly more than what Trump is demanding for the wall. And lawmakers throughout Capitol Hill are fierce guardians of that cash. 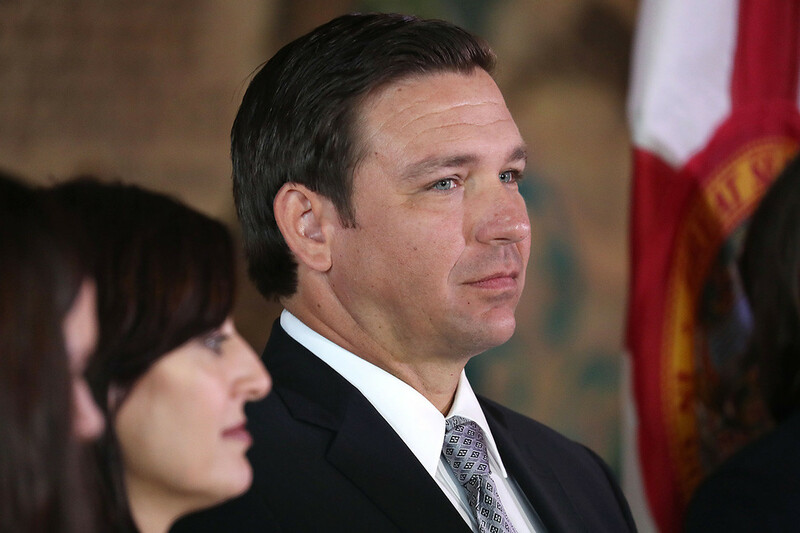 “We have people counting on that,” said DeSantis, whose state has relied on decades of mammoth Army Corps projects to drive much of its economic growth. He added that if the administration does tap the Corps’ budget, it should be returned as soon as the federal government is reopened. “If they backfill it immediately after the government opens, that’s fine, but I don’t want that to be where that money is not available to us,” he said. The Corps also has nearly $ 14 billion of unspent money out of a pot of $ 17 billion that Congress gave the agency last year for recovery from disasters such as California’s wildfires and hurricanes Harvey, Irma and Maria. Administration officials identified $ 5 billion of that cash as a potential source of wall funding, Garamendi said based on a list his office had obtained — but it would only drain from aid to California and Puerto Rico, he contended. Garamendi would not say how he obtained the list of targeted disaster projects but said he was confident it was accurate and had been presented to Trump. He said the plan presented to the White House would spare projects in Texas, Florida, Louisiana and South Carolina. Instead, he said, it would steer money away from efforts to raise the height of the Folsom Dam in Northern California and build flood protections along southern San Francisco’s shoreline, among others. “The bottom line of it is, these are very real, necessary projects that Congress, over a period of time, has said must be built,” Garamendi said. Garamendi said another targeted California project — meant to shore up Lake Isabella to withstand damage from earthquakes — sits just upstream of the Bakersfield district of House Republican leader Kevin McCarthy. It’s unclear whether the White House would even still be considering such a step, especially after Trump said Friday that he’s not about to declare an emergency to end the shutdown. Even after he spoke, the office of Sen. John Cornyn (R-Texas) sent out a statement essentially warning against messing with his state’s recovery from Hurricane Harvey, a massive deluge that swamped the Houston area in 2017. Cornyn wasn’t the only key Republican raising concerns. Democrats, meanwhile, were looking for ways to block such any such effort. Rep. Grace Napolitano (D-Calif.), who’s in line to chair a key subcommittee, said her panel would call in the Corps’ top military commander, Army Lt. Gen. Todd Semonite, to testify if Trump moved ahead with the plan. “We are researching both legislative and/or legal options, but I have no conclusion ’cause we don’t know exactly what he’s going to do yet,” House Transportation Chairman Peter DeFazio (D-Ore.), whose committee oversees the Army Corps, told reporters. Federal law allows the Defense secretary to halt funding for “Army civil works that he deems not essential to the national defense” during a national emergency and instead use the funds for “civil defense projects that are essential to the national defense.” But DeFazio argued that the Corps’ budget does not have any fat, pointing out that the agency already faces a $ 40 billion backlog on projects involving dams, levees, locks for commerce and dredging in ports. “To take money from the Corps for a wasteful and ineffective wall when they are already underfunded to meet the real needs of the American people is a travesty,” DeFazio said. Trump wouldn’t be the first president to feel the blowback from lawmakers’ fierce attachment to Corps projects, which affect every congressional district. In late 2007, former President George W. Bush suffered his first congressional veto override after he tried to reject a sprawling bill authorizing billions of dollars in Corps projects. Multiple news reports this week have also indicated that the Trump administration was weighing the use of an emergency declaration to tap from military construction funds, which are separate from the Army Corps’ civil works budget. But that strategy would raise its own obstacles, including questions about whether it would represent a step toward politicizing the military. In recent decades, the emergency use of that money has almost exclusively been to support military operations overseas or to beef up domestic defenses in the wake of the 2001 terrorist attacks on New York and Washington. It “has been used a dozen or more times in the past couple of decades, mostly associated with the global war on terrorism and the 9/11 declaration of emergency,” said John Conger, who oversaw military installations in the Obama administration. In addition to setting a perhaps troubling precedent, invoking Trump’s military authority for the wall effort could paradoxically complicate efforts to get the barrier built speedily. That’s because military construction projects have a notorious reputation for being bogged down in government bureaucracy — much like the Army Corps’ civil projects, which are rarely noted for blazing speed. For one thing, the Pentagon would probably have to conduct a thorough environmental assessment before breaking any ground for the wall. Bob Hale, a former Pentagon budget chief, said tapping the military construction budget could harm readiness. Anthony Adragna, Matt Dixon, Connor O’Brien and Wesley Morgan contributed to this report.